If you read my post about my experiences in Paris, I really enjoyed reflecting and looking through my old photos! Barcelona is a city I hold in my heart, I've visited 4 times now and each time it leaves me wanting to go back again because there are still many things I haven't seen of it. To run with the theme of my last post, I will translate my thoughts into Spanish below. Estas imágenes son de mis vacaciones en 2010 en agosto. ¡La calidad de estos me ha sorprendido increíblemente! Una parte, la última – yo recuerdo la vista hermosa, conduciendo las curvas de las carreteras en las grandes colinas. Como una joven turista yo saqué un montón de fotos, pero considero que esto captura lo mejor su belleza. Durante este viaje visitamos a Barcelona, San Sebastián con un monasterio bonito, y una de mis ciudades favoritas, Santander. 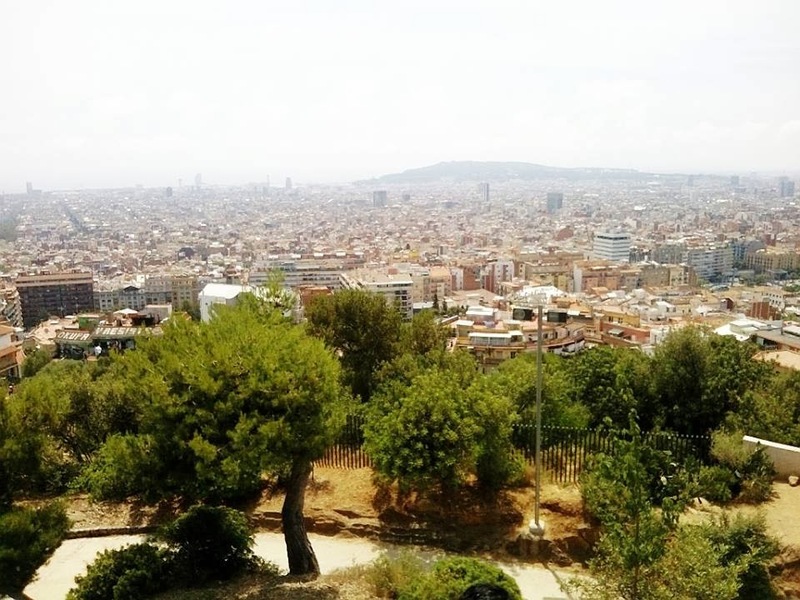 En la segunda y la tercera foto, se puede ver Parc Güell en Barcelona, mi lugar preferido por toda la ciudad. Cada aspecto fue diseñado por Antonio Gaudí, incluso los muros y las ventanas. A mi parecía que él quería representar todas sus ideas del arte en este increíble monumento, ¡si tu visites debes mirar a todo en tú entorno! These pictures are from my holiday in August 2010. The quality of these was such a surprise! Particularly the last photo - I remember the incredible view, driving round the bends of the motorway around the massive hills. As a young tourist I took about a million photos of this view, but I think that this one captures its beauty the best. On this holiday we visited Barcelona, San Sebastián which has a beautiful monastery, and one of my favourite cities, Santander. In the second and third photo, here you can see Parc Guell, my favourite place in all of Barcelona. Every inch of the public park has been designed by Antonio Gaudi, even the walls and every window. It seemed to me like Gaudi's manifestation of all his ideas about art in one place, which means if you visit you have to look all around you! Est foto es de mis vacaciones con mi ex novio el verano en 2013. Tuvimos mucho tiempo para descansar, y también yo quería practicar mi español después de mis exámenes. Era muy divertido explorar un parte diferente de Barcelona , porque no teníamos que seguir una rutina estricta. Además el hotel en que nos alojamos no fue demasiado cerca al centro, por tanto no había muchos turistas. En la primera foto habíamos descubierto un centro comercial bastante cercano a nuestro hotel. A lo alto del edificio fue un grupo de restaurantes bonitos pero caros también. La última noche cenamos en uno de los restaurantes para mi cumpleaños, era inolvidable. Otra vez visité Parc Guell, y aquí se puede observar la vista asombrosa de toda la ciudad. ¡Yo recomendaría Barcelona para hacer turismo, hay tantos lugares explorar! These 3 photos are from my holiday last summer. We had lots of time to relax and I also really wanted to practice my Spanish having done my A level exams. It was so fun to explore a different area of Barcelona, because we didn't have any concrete plans or strict routine to follow. Our hotel wasn't too close to the centre meaning that we didn't often encounter many tourists about. In the first photo, we had just found this amazing shopping centre not far away from our hotel, and at the top there was a small group of beautiful but very expensive restaurants. The last night in Barcelona my ex took me to one of them as my birthday treat, it was an unforgettable experience. I visited Parc Guell again, and here you can see the amazing view from the top of the park. I would recommend Barcelona as a perfect place to sightsee, there are so many places to discover! | the irony of "real women"